1. RB Alexander Robinson is expected to start, but will still likely be hampered by a groin injury. Robinson is the most dangerous weapon on offense for ISU and they need him to be close to 100%. 2. Iowa State moved up to 3rd in the nation in net punting with a 42.65 average. Michael Brandtner is 20th in the nation with a 44 yard average. 3. The Offensive Line has been the strength of the team. The OL is #1 in the nation in sacks allowed and 20th in the nation in rush offense with 207 yards each game. 5. The Cyclones enter the game with a 10 game Big 12 conference losing streak. 6. The Cyclones are currently 65th overall in total defense. Jesse Smith leads ISU with 49 tackles. 1. 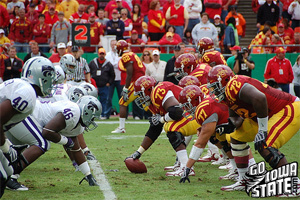 Balance on Offense – The Cyclones have been leaning heavily on the running game in the first five games. Iowa State needs to throw the ball better to win this game. I am not saying they need to throw on every down, both parts of the offense must be working. I could see ISU hanging in this game if they end up with 275-300 yards passing and 150 yards rushing. 2. Aggressive Game Plan – ISU needs to be aggressive in all three phases. Kansas is going to score points so the Cyclones need to score in non-traditional ways to win (defensive scores, blocked punt/kick, punt or kick return, trick play on offense, etc.) 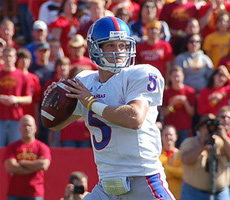 I would like to see them get some heat on Reesing and force him to make some quick decisions. 3. Healthy Alexander Robinson – ARob has been the one big play guy Iowa State has on offense this year. Without him it will be difficult to match the Jayhawks playmakers (Reesing, Meier, Briscoe, Sharp, etc.) Will anyone else step up as a playmaker this year? 1. Austen Arnaud – Some Cyclone fans have been unfairly harsh on Austen this week. If the extra point isn’t blocked, the message boards may have been buzzing about Austen leading the Cyclones on the impressive game tying two minute drive. Can Austen play better? Absolutely. He would be the first to tell you. Coach Herman has been reluctant to open up the offense so far this season, but he needs to do it this week. We will need the passing game to be much better to win any of the remaining games on our schedule. The only way the passing game gets better is working on it in game situations. 2. David Sims – Sims has been fairly quiet the last couple of weeks after a fast start. He is the most athletic player on our defense and we need him to make some big plays. 3. Josh Lenz – Kansas has struggled covering punts this year, so there may be an opportunity for Lenz to make a big special teams play that ISU desperately needs. Iowa State lost a game last week that most of us were counting on to get to the magic number of six wins. So the Cyclones need to win one we are not expecting to get. I don’t see it happening this week. Kansas is rolling on offense so it will be difficult for the defense to keep the Jayhawks under 30 points. The offense will need to make huge improvements in the passing game to score more than 30 on a good Kansas defense. Austen Arnaud will play well and our offense will be more balanced, but it won’t be enough. Kerry Meier is a tough matchup for our defense and I think he has another big game.